Visit Petfinder's adopted pet list to view the gallery of our Rescue dogs that have found their furever homes. I was in pretty bad shape when I got to John and Irene's house in Tulsa. A nice lady had spotted me at the Benton, Arkansas shelter in July, 2004. Her name was Janet Bailey. 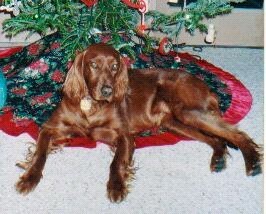 I am named after her because she saved my life by getting me out of that place and hooking me up with Irish Setter Rescue. I had escaped from my former owner several times, but this time I was so glad when he didn't come to take me back. I was only four years old and I was so emaciated. I had already had puppies four or five times. I had to live in the backyard and I was a mess. I had lost a lot of hair, had worms in my belly and heartworms in my heart. I had ear infections and two rotten teeth that had to be pulled. I had nightmares and would startle easily for a long time after I got to John and Irene's house. I am severely thunder phobic and I don't like loud noises. 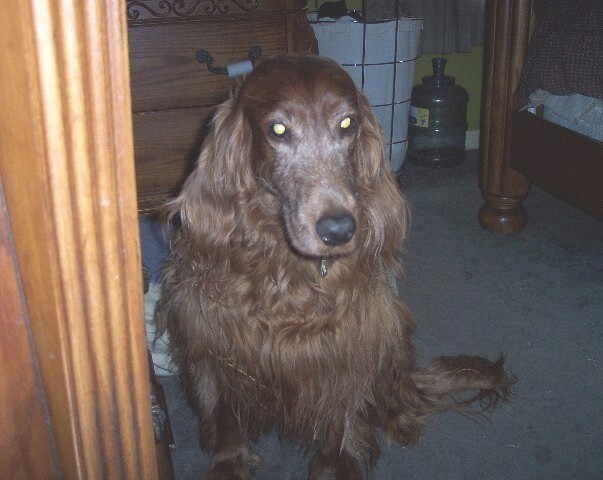 But I've put the past behind me and I'm here today to tell you that if it wasn't for the wonderful Irish Setter Rescue volunteers, I wouldn't be alive today. "Mom and dad" couldn't give me up after the four months that it took to get through all of my medical treatments. I love my nice comfy life in Tulsa with mom and dad and my Irish Setter brothers Riley and Hoover, and my Greyhound brothers and sisters. But most of all I found my big sister Sophie, a German Sheppard, to be the best comfort of all when dad is at work. I really love my mom and dad and they really love me, even with all my quirks. Clancy was one of five 8 week-old puppies picked up by rescue volunteers, John and Irene, near Tulsa, Oklahoma. The parents of the litter were not much more than puppies themselves, and their owner didn't know much about raising a litter of puppies. The five puppies ranged in weight from 3 lbs. 5 ozs. to 9 lbs. 1 oz. Their owner had been unable to find buyers and wanted the puppies to be gone. It was just before Christmas. John and Irene and their vet nursed the puppies to good health over the next several weeks and by the second week of January they were ready to move on to their new homes. The first two flew to homes in Florida; the other three flew to their new homes in the northeast part of the country over the next several weeks in between ice storms and airport closings. Clancy is now six months old and weighed 31 lbs. when he had his last booster shots in March. Our vet believes he will weigh about 70 lbs. when he is all grown up. Clancy loves going to doggy day care three times a week. When I take him in the mornings he is so excited that he drags me to the door and then he tries to jump over the counter. He's not a morning man after he has been to doggy day care. He moans and groans when we wake him up in the morning for his potty break. Sometimes my husband has to carry him outside in the morning, but that won't last long. Clancy has a great personality and he is very inquisitive. He just cracks me up every day, especially the day he took my mom's hair piece out of her bag and ran with it. Cody came to live with us as a foster dog in July, 2006. He had a crusty, bloody nose, yeast infected ears, infected callouses on both elbows, no hair on his back and little hair on his tail. He was 15+ pounds overweight and flabby with little muscle mass. To add insult to injury, he must have been confined a lot in his crate because he couldn't straighten his back legs. We had his infections treated, put him on a high grade kibble, canned food, fresh cooked meat, lots of fresh cooked vegetables and a fish oil supplement. We fed him three times a day so he didn't feel hungry as he gradually lost weight. We also started taking him on several short walks a day. He was so lacking in stamina he could only go a short block before becoming exhausted. Slowly he regained the full use of his hind legs, began loosing flabby weight and started gaining muscle mass. As soon as he was able we added several weekly trips to the dog park. Those outings were so enjoyable that it is now an almost daily routine. What a joy to see him running from tree to tree chasing the squirrels. Watching Cody morph into the healthy, happy, beautiful dog that he was meant to be has been a very rewarding experience. 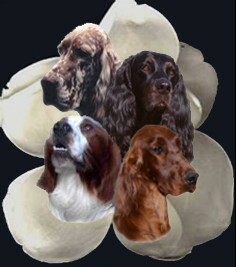 He is so gentle and loving he constantly reminds us why we originally fell in love with the Setter breeds. 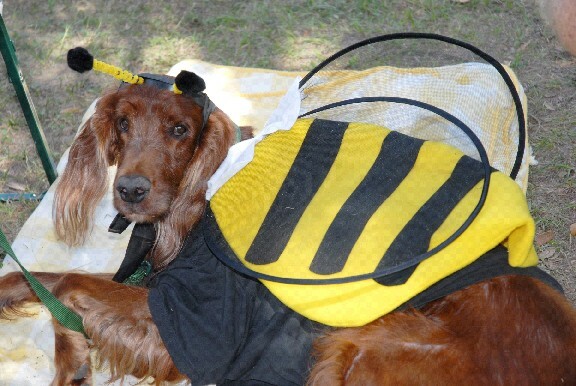 This is Cody wearing his bumble bee outfit for the costume contest at SetterFest in October, 2006. This is Maggie and Rosie! 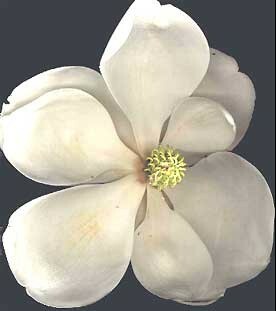 I know Rosie is dying to talk, but I am older so I'll go first. I have been with my forever family for three years and am very lucky. When I was rescued they called me Sassy--because I was! Five of my puppies and I were left beside a road and someone found us. Thank goodness! The FL All-Setter Rescue took us in and fixed us up and we were adopted. Sue and Bryan took me in and turned me into a real couch potato. I have another sister, Sandy, a rescued terrier mix who is much older then I am. She and I got along right away. WOW--I not only got to live in the house but sleep on the bed, couch, or chair and eat interesting food like pizza. I didn't realize just how lucky I was. Even though I was glad to be here, I didn't know if I would get to stay. Then six months later I got really scared. Bryan took us out early while he was closing the horse in for the night. Sandy was afraid of loud noises and there was a lot of loud music and noise everywhere. I got really scared and jumped the fence (5 feet). I had never jumped a fence before. I didn't know where to go and ran and ran and ran. The noise was horrible. I ran until I could run no more. Little did I know how lucky I was because I had run into the Everglades which is 18 to 20 miles away! In the morning I saw two men across a canal and swam over to them and jumped in their truck. The next thing I knew Bryan and Sue were there and I was never so glad to see anyone as I was to see them. Mom held me all the way home in the truck. I was not hurt except for my paws, so Dad carried me everywhere for days and they stayed home from work with me. I found out later it was something called New Years Eve and it happens every year! Thank goodness for my microchip and tag information--that is how they found out where I belonged. I was very happy to be home and now I stay very close to them when I am outside. Lately this New Years thing has not been as bad as that year, the guns are less and the music is not as loud. Sandy and me get something called Rescue Remedy. 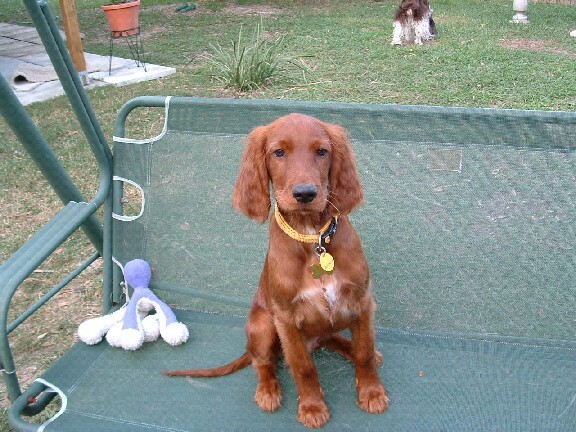 In 2005 I heard Mom say she thought I needed a playmate--whatever that is. Little did I know it would be another dog! Then Rosie came into our lives…..
Me--Me, it's my turn. I want to tell my story. Please let me talk now! Oh, OK. My name is Rosie, and I came to my forever home from Kansas City, Kansas. I was living with my owner's father and mother, when one day a stranger came to see me. She sat on the ground to hug and kiss me. I did not know what that meant but I found out later in the summer. I went for a long car ride with Bill and a very nice person picked me up; John took me home to Tulsa. He and Irene gave me special wonderful love and treats. I thought I was staying with them, but I later found out my journey wasn't done. Next, I was in the car again with John and Irene and another Irish Setter for a long drive. We went to Bonnie's house in Florida, full of dogs who looked like me, for a week, and then that strange lady came back. You know, the one that I met in KC. This time she brought a man with her and guess what--they put me in the back seat of a big truck and I went for another ride. When we got there I found out this was to be my NEW HOME. It took me a while to realize that I was not moving again, but I think I finally believe it. There are two other dogs here and we get along great. I tried to blame them for all my mischief but that didn't work. I don't know why Mom and Dad kept me but they did. When they went to work they left me out of a cage and I guess I went wild. I had always been in a cage when no one was home, but at this house none of the dogs were in cages. It has been a year and a half since I moved in and I have to admit I have been a terror. I finally stopped eating the leather couch and chair, but I did like stripping the linen off the bed. The hardcover books, plastic, and shotgun shell casings were very interesting. But I have to admit I like the pizza crust better and the yogurt and the bread and the meat. Now I only eat the chair Mom calls the Sandy chair, it's the one Sandy uses to sleep on. I am not sure why I still chew, I guess I get mad and I don't like it when they have to go to work. Mom says they don't like to have to go to work either. I am good at one thing-- Mom says I am teaching Maggie how to play and have fun, whatever that means. We have lots of toys and bones. Maggie told me she never knew how to play and never got to do that before. Me, me, me-yes, Rosie is teaching me how to play and I am told she is teaching me not to come when called! All we know is that we are lucky. We take turns sleeping on the bed at night, we like it when Dad sits between us on the couch, we love to be petted, and we love sitting in Mom's lap. YES, we are very happy with Sue and Bryan. 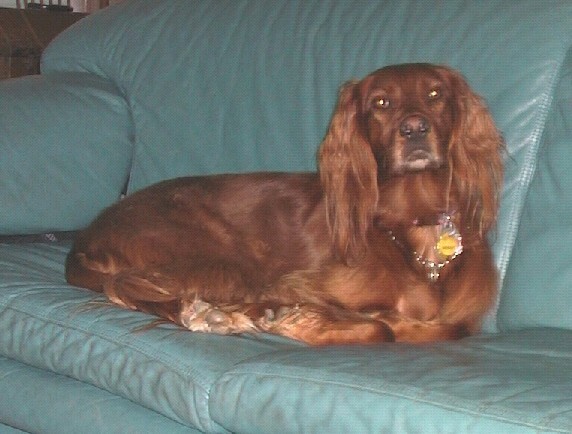 Thanks to FL All-Setter Rescue/Magnolia Setter Rescue, we have found our forever home.